The cricketer Kenneth Farnes was born on 8 July 1911 at 141 Wallwood Road (rebuilt since), the son of a brewer’s clerk. He was educated at Royal Liberty School, Romford and at Pembroke College, Cambridge where he read geography and history and won a blue each year 1931-33. He was 6 feet 5 inches tall. He became a schoolmaster at Worksop College in Nottinghamshire. Unmarried, he was killed when the Wellington bomber which he was flying crashed at Chipping Warden in Oxfordshire on the night of 20 October 1941. 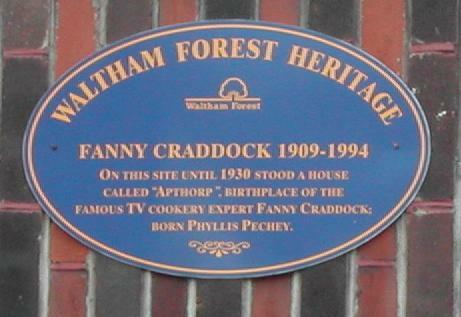 TV cook Fanny Cradock was born on 26th February 1909 at 'Apthorp' in Fairlop Road (now replaced by a block of flats).